Give your customers the freedom to see, hear, and speak to anyone at their door, even if they aren’t home. That’s the kind of peace of mind that comes with DMP’s new V-4060DB Video Doorbell, available to order today! The Video Doorbell is fully supported by the Virtual Keypad app. This lets customers check in on their homes whenever they’d like. Any time motion is detected or the doorbell is pressed, they’ll receive a notification and be able to monitor who’s approaching with 1080P precise clarity, 180-degree field of view, and Pinch-to-Zoom technology for a closer look. Images displayed with push notifications are also viewable on Apple Watch iOS. 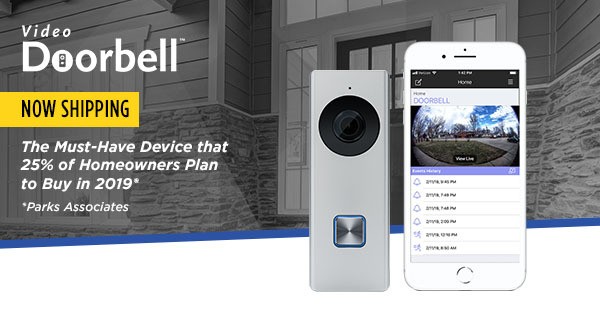 According to market research by Parks Associates, 25 percent of U.S. households with broadband plan to buy a smart video doorbell in 2019 — a massive jump from just 8 percent one year earlier. By adding our new Video Doorbell to your residential security system installations, you’ll be giving customers the security they want and the DMP quality you know they need for a complete security solution inside and out. To learn more, please refer to the featured product page on DMP.com or the documents below. For questions and orders, please contact DMP Customer Service at 866-266-2826 or CustomerService@DMP.com.